•	There is only one team in baseball that is undefeated in one-run games: the Boston Red Sox at 4-0. •	The Sox at 5-2 have the most road wins in baseball. •	The Sox have not faced any teams in the AL Central or the AL West. •	There are 21 MLB players with at least three homers and three doubles this season including Dustin Pedroia (and also former Red Sox Adrian Gonzalez, Will Middlebrooks and Yoenis Cespedes). •	Of all the balls Brock Holt has put in play, 31 percent have been line drives. He has a BAbip rate of .480. •	As a team, the Sox Rtot, which measures runs above or below the average based on runs allowed or prevented, is plus-1, led by Mike Napoli and Brock Holt who are both plus-2; Hanley Ramirez and Xander Bogaerts are each minus-3. •	American League teams’ pitchers have averaged leaving 91 runners on base this season; the Sox staff has stranded 91. •	MLB teams’ batters have averaged leaving 92 runners on base this season; Sox batters have stranded a major league leading 119 runners. 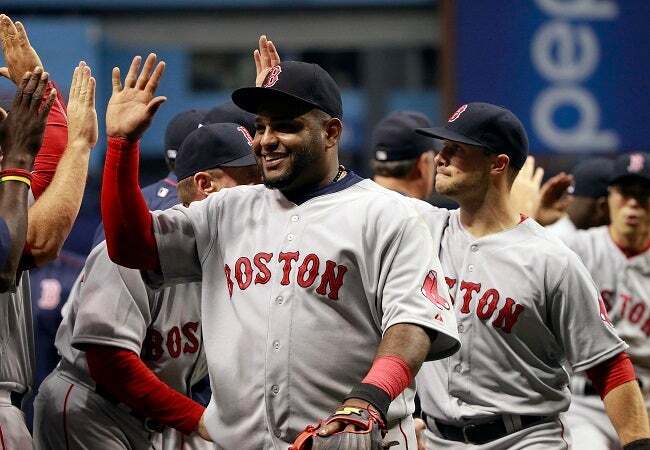 •	Pablo Sandoval, Daniel Nava, Mike Napoli, Shane Victorino, and Ryan Hanigan each have only one extra-base hit. •	Mike Napoli, Allen Craig, and Justin Masterson each have one RBI. •	Brock Holt and Daniel Nava have each walked once. •	Pablo Sandoval has struck out 12 times, while David Ortiz, Mike Napoli, Dustin Pedroia, and Mookie Betts have whiffed 11 times each. •	The Sox are 8-for-8 in stolen base attempts. •	David Ortiz, Dustin Pedroia, and Hanley Ramirez have each grounded into three DPs. •	Ryan Hanigan is looking at a team-leading 4.55 pitches per plate appearance. •	Batters are only hitting .129 against Joe Kelly and .130 against Craig Breslow. •	The Sox have not permitted a sac bunt this season. •	Justin Masterson is averaging 8.2 runs support per game. •	Clay Buchholz has a 66.9 percent strike pct., the best amongst Sox pitchers. •	Anthony Varvaro leads the team with 64.3 percent first-pitch strikes or balls put in play.